I would say there is something post-Guardians of the Galaxy that hasn't been Grooted, but that would probably be a lie. 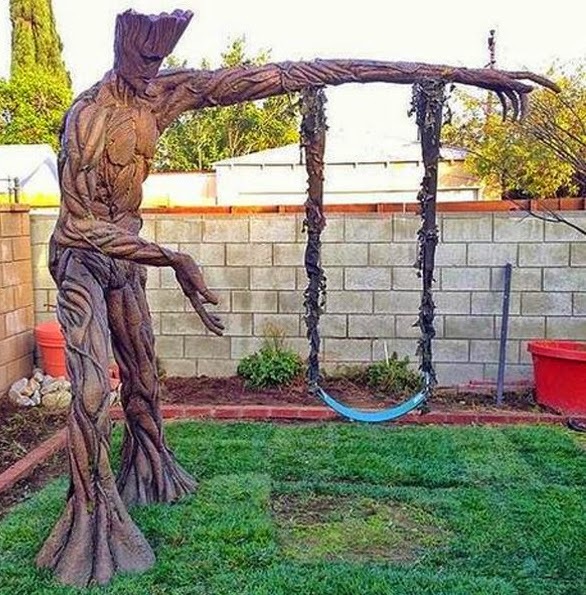 Made for an upcoming TV show called Super Fans, Super Builds, and spotted by James Gunn himself, this swingset looks perfect for any rocket raccoon sized humans near you. While you can swing on his armpit hair if you use both hands (unless you want to change the TV show to America's Funniest Home Videos), watch for neighbours green with rage to try and chop your fan happiness down in a Ronan type rage. Amazing what some people think of huh Comicsfan? God, to be 5 again. I think I would still give it a go now Pensol - you know being 5 at heart for 30 years deserves at least one swing!